Captain of the team, Dustin Brown is an almost unbelievably, naturally gifted forward. He was part of the 2010 US Olympic Team that brought home the silver medal from the Olympic Winter Games in Vancouver. Brown also ranks second in the NHL with 287 hits. Having said these, his leadership and sports skills bring in a huge contribution for the Kings. At only 25, Brown has yet to make a bigger impact and break more records in the history of NHL. They not only play for the win, but also for the community. This season, the team is hosting “Star of the Month”, a program arranged in partnership with Make-A-Wish Foundation where they will grant wishes of two children with life-threatening medical conditions to meet and get up close with the players. This is only one of the community programs that the Kings participate in—what goes around comes around and the team will be at the top of the wheel soon. On his way to recovery, Matt Greene’s recovery from a shoulder injury should bring in a whole lot of defense for the team. He is expected to return by the end of October and I have high hopes that his come back would rattle the other NHL teams. Over the years, the LA Kings have been coached by the best names in NHL. Their last three coaches, for example, helped greatly to improve the team. 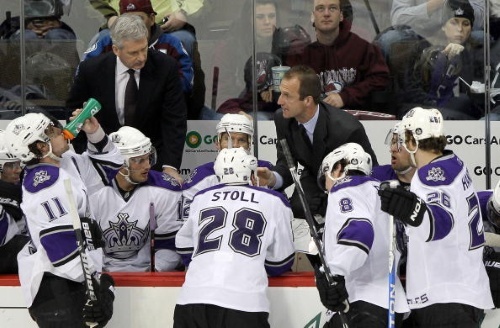 Andy Murray, who was head coach from 1999-2006, guided the Kings to post 35 or more wins in three consecutive seasons (1999-2000, 2000-2001, 2001-2002), a first time in the team’s history. Marc Crawford, head coach from 2006-2008, also helped the team improve on a lot of areas. Terry Murray is the current head coach and seems to be doing a good job in enhancing the team’s stats. These prospect players show great potential in bringing in the wins for the Kings in the future. Jonathan Bernier will be used once a week now by Coach Murray to take Jonathan Quick’s place as goalie. Derek Forbort is also being spotted as one of the best defensemen and has great future ahead of him in NHL. These two would definitely be great assets to the team when their time comes. I really admire how Dustin handles the team. thanks for updating us through this blog.